We’ve mentioned on numerous occasions the growing problem of space debris and voiced our concerns that, if left unchecked, the thousands of metal junk fragments currently out there could seriously affect space missions and even threaten lives. In Earth’s orbit, even a tiny metal fragment could potentially wreak havoc upon impact with a spacecraft or satellite because of the extremely high kinetic energies involved. The International Space Station regularly comes in contact with such fragments. Sometimes, astronauts aboard need to perform a space walk in order to repair or replace a damaged solar cell or some other device. A ballistic test that demonstrates the kind of fire power the ISS is thrown against each day was recently released by the ESA. 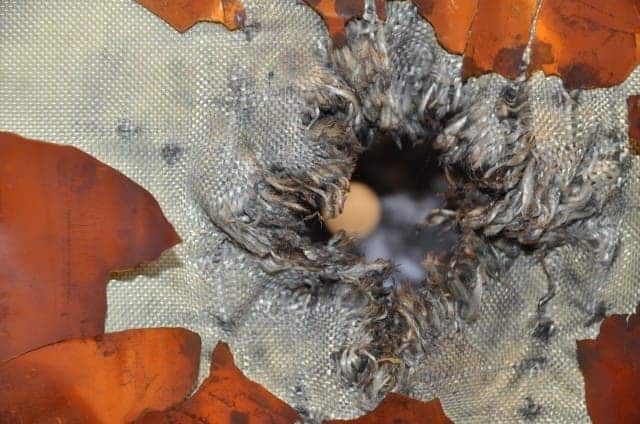 This burned and torn through piece of kevlar shiled is the result of the test which used the Fraunhofer Institute’s Extra Large Light Gas Gun – a huge air cannon, basically – to shoot a 7.5mm (0.3in) aluminium bullet. The kevlar shield is the same as the one used to layer the manned modules of the International Space Station and protect the crew, while the firing bullet mimics a metal junk fragment traveling at 7 kilometers per second or 15,600 mph. I know, this looks very scary but believe it or not, the Kevlar did its job well since the aluminium casing it shielded remained intact. Actually, apart from a small dent and the scorching remains, the casing remained otherwise unharmed. The test proves that Kevlar is truly one tough mother, but it also gives to show that space debris is no funny business. 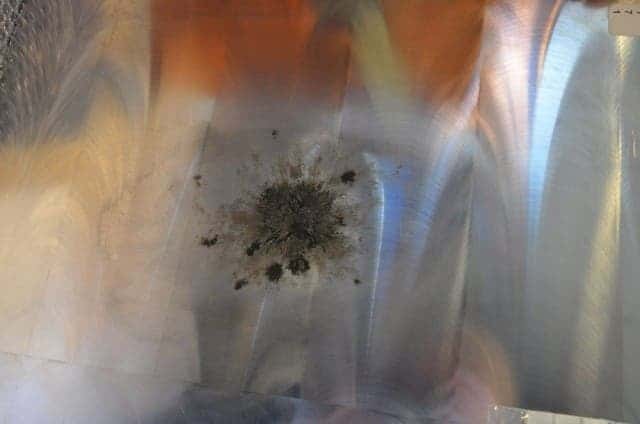 Last year, the International Space Station went on full alert and the astronauts stationed there were forced to reach for their escape pods until further notice after mission control spotted a risky space debris trajectory that could have made impact with the space station. Luckily, the impact was averted. Those of you who’ve watched the movie Gravity must be thinking if the scene where the space debris shooting the ISS are accurate. Despite the movie’s numerous short comings in terms of scientific accuracy, the very frightening scenes where the space debris collide with the station causing a monstrous chain of events are very much accurate. What can the world do about space debris? Well, there are some ideas thrown about, ranging from a janitor satellite to a full blown giant ground laser that zaps the debris. If these work it remains to be seen, but for now the best thing the world’s space agencies and governments can do is to avoid creating more debris. In 1997, China intentionally blew up one of its satellites to demonstrate a weapon project. As a result more than 3,000 pieces of debris were scattered in orbit. Seriously, people should stop doing stupid stuff like this! The results of the shielding test can be read in depth at ESA.